Have you ever beat yourself up over not responding to every message you received in a day? Me too. I know how it goes. On one hand, you're tired and overwhelmed. But on the other hand, there are emails! Texts! Calls! All demanding a response! It doesn't matter if we feel uncomfortable, exhausted, or just plain unwilling. If we don't do these things, then we're unkind and rude. Right? In the Unbreakable Kimmy Schmidt pilot episode, reporters interview women who spent 15 years underground in a doomsday cult's bunker. One woman shares the story of her involvement: "I had waited on [the cult leader] at a York Steak House ... and one night he invited me out to his car to see some baby rabbits, and I didn't want to be rude, so ... here we are." It's a searing example of how the fear of being rude and impolite can put us in real danger. And sure, the character is exaggerated to the point of parody, but I recognized myself in that woman. A while back, I was struggling with whether or not to respond to some troubling emails. I didn't feel comfortable keeping in touch with the sender, but the thought of not responding triggered feelings of guilt and insecurity. What if I hurt this person's feelings? Was I not being compassionate enough? Should I be polite, or listen to my intuition? Eventually, I asked my husband Jonathan for his perspective. 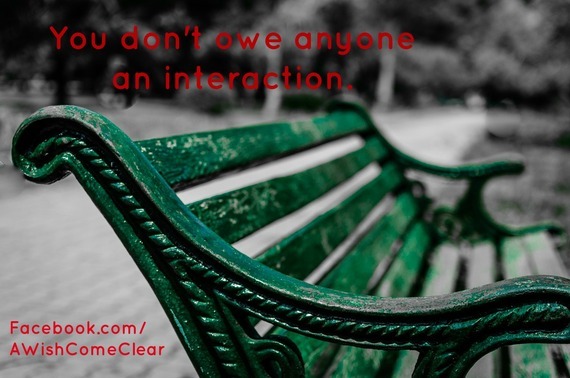 He said, fiercely, "You don't owe anyone an interaction." When Jonathan said those six words, they freed me to delete those emails. Sometimes, not interacting is the most loving choice. Yes, I practice good manners, sending thank-you notes, and staying connected to friends. But I also set boundaries and trust my intuition. There's a balance. If you don't have practice with boundaries, though, it's hard to protect your time. You'll feel like a bad person when you step back or say no. When the false guilt strikes, remember that there is a difference between hurt and harm. When you say, "I don't owe anyone an interaction," you're not harming anyone. You're just reminding yourself of what is true. It's not your job to people-please or walk on eggshells. Rather, your job is to live with love and integrity. Will some people have hurt feelings if you decline their invitations and delete their messages? Probably. That's tough to accept, but the alternative is worse. Trying to manage other people's emotions while tuning out your own is exhausting. It harms your health and your relationships. We've been conditioned to believe that being kind means being available 24/7. But if we don't guard our time, our ability to be kind erodes. So the next time you feel pressured to respond, try taking pause and reminding yourself that you don't owe anyone an interaction. Revel in the reality that you get to choose. You have the authority to decide how to spend your time and energy. And here's the real beauty of it: when you don't owe anyone an interaction ... you're free to give from the heart. This piece first appeared on A Wish Come Clear, a blog devoted to helping you choose love, lose fear, and find home. Visit and receive free copies of Caroline's three digital books, all designed to bring you back to what matters most.